Karl W. asks: Why are calico cats always female? While any breed of cat can be born with calico fur, the vast majority of these cats are female, with only about one in three thousand calico cats born male according to the Humane Society. So why are most calico cats female? As you may or may not be aware, females have two X-chromosomes, meaning that they can only pass down an X-chromosome to their offspring. Males, on the other hand, have an X-chromosome and a Y-chromosome. This allows them to pass down either an X-chromosome or a Y-chromosome to their offspring, determining the genetic gender. Thus, a female receives an X-chromosome from both of her parents while a male receives an X-chromosome from his mother and a Y-chromosome from his father. This is true for both humans and cats, along with many other animals. The important thing here is that the same X-chromosome does not inactivate for each cell. One cell may shut off the X-chromosome from the mother while leaving the chromosome from the father. That cell then creates more cells, each of which will use the father’s X-chromosome to determine the fur color. Likewise, another cell may silence the X-chromosome from the father and instead use the chromosome from the mother. So, for instance, if the female offspring receives the chromosome for black fur from both of its parents, she will have black fur. In the case of calico cats, the same process occurs. However, the offspring receives the chromosome for, for instance, black fur from one parent and orange fur from the other. One cell inactivates the chromosome for black fur resulting in orange fur. Other cells use the chromosome for black fur instead. In both cases, these cells are replicated and the inactivated chromosome will always stay inactive. Those two colors then combine on the cat’s fur to create the orange and black patches of fur. If the cat only has these two colors, it is known as a tortoiseshell cat. The tri-color, calico (or often called “tortoiseshell-and-white” outside of North America), with the presence of white fur, happens due to a gene unrelated to the X and Y chromosomes. This results in piebalding, where skin and fur that would normally be pigmented lacks pigmentation, resulting in a white color. So, if a cat needs two X-chromosomes in order for its fur to be calico, how do male calico cats exist at all? A male cat can have tri-colored fur if he inherits an extra X-chromosome, making his genetic makeup XXY. In humans, this condition is known as Klinefelter Syndrome, which is surprisingly common at about 1-2 out of every 1000 live male births, with many who have the condition remaining ignorant of it. In humans, as with cats, the individual in question is usually considered genetically male despite having two X chromosomes. Besides potential other health issues, the extra X-chromosome almost always causes male calico or tortoiseshell cats to be sterile. 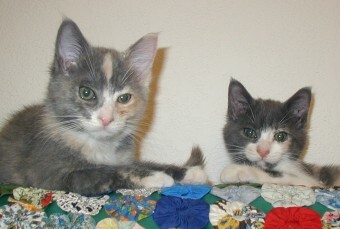 In the exceptionally rare cases where the male is not sterile (about 1 in 1,000 of the already rare 1 in 3,000 male calico cats), attempting to breed him with a female calico or tortoiseshell will not produce male calico or tortoiseshell kittens at a higher than normal rate, nor would he be more likely to produce male calico or tortoiseshell kittens as he would almost always only pass on his Y chromosome to the male offspring, excepting potentially in the, once again, exceptionally rare XXY cat. For this reason, and potential other health problems with the cat, even when these rare fertile male calico or tortoiseshell cats do pop up, they are almost never used for breeders as there are simply no advantages, and some disadvantages, to using them over more virile felines. Cats are thought to have been domesticated around 9000-10,000 years ago. The first known potentially domesticated cat was discovered in a 9,500 year old grave. It was once popularly thought that cats were domesticated by humans in order to provide rodent control. However, it is now thought that they were probably self domesticated with certain cats with the predisposition to be friendly to humans gradually becoming adapted to domesticated life as they scavenged near human settlements. Cats can see quite well in light levels as little as 1/6 of what is required for humans to see normally. They accomplish this largely via a tapetum lucidum, which reflects light passed through the retina back into the eye. They also have exceptionally large pupils for their body size and a much higher density of rods than humans do. Cats also have some of the best hearing of any animal. They can hear frequencies as high as 79 KHz and as low as 55 Hz. For reference, humans hearing range is typically between 31 Hz to 18 KHz and dog’s hearing range is typically between 67 Hz and 44 KHz. This extremely good hearing helps cats hunt rodents as rodents often communicate in ultrasonic frequencies which the cats can hear. Cats have exceptional vision when viewing far away objects, but horrible vision, 20/100, (see: How the 20/20 Vision Scale Works) on objects very close to them. This, along with the fact that cats have a blind spot in front of their nose, is why cats will sometimes appear not to recognize when food is placed right in front of them. Why Are Most Calico Cats Female? Are all orange tabby cats male and are all calico cats female? and aren’t female ginger cats rare too? My ginger cat O.J(Orange Juice) is a bit of an oddity, she’s out of a short haired tortoiseshell Manx, and a short haired ginger male moggie but she has a) a tail, and b) long hair. she has a kink in her tail and a white feet, bib, and stomach. she’s rather eccentric too, sleeps in the coal bucket, lunch boxes, and especially in my arms under the blankets in bed.